Drought Indicator Reports from April 2017 back to February 2016. Faced with a stubborn drought and the warmest April on record in Atlanta, the Georgia Environmental Protection Division (EPD) is urging metro Atlantans to conserve water and follow the state’s outdoor water use schedules. During a Level 2 Drought Response, outdoor landscape watering is allowed up to two days a week, determined by odd and even-numbered addresses. Even-numbered addresses and properties without numbered addresses may water on Wednesday and Saturday before 10 a.m. and after 4 p.m. Odd-numbered addresses may water Thursday and Sunday before 10 a.m. and after 4 p.m. 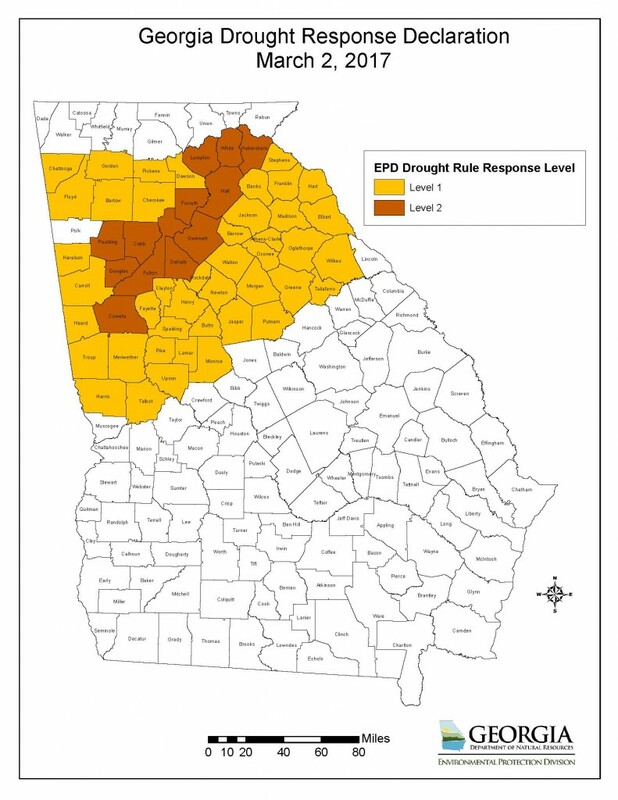 The Level 2 Drought Response has been in place since November in the following 12 counties: Cobb, Coweta, Dekalb, Douglas, Forsyth, Fulton, Gwinnett, Habersham, Hall, Lumpkin, Paulding and White counties. These are counties that depend on Lake Lanier and the Chattahoochee River for water supply. Washing hard surfaces such as streets and sidewalks. Water for ornamental purposes, such as fountains. The use of fire hydrants, except for firefighting and public safety. Irrigation of personal food gardens may be done at any time of day. Drip irrigation or irrigation using soaker hoses may be done at any time of day and hand-watering with a hose with automatic cutoff or handheld container may be done at any time of day. General landscape watering may be done after 4 p.m. and before 10 a.m. on the designated days. EPD closely monitors a number of drought indicators including streamflows, reservoir levels, groundwater, short-term climate predictions and water supply conditions. Should conditions deteriorate further, a Level 3 Drought Response would have to be considered. A Level 3 Drought Response prohibits most types of outdoor water use, including general landscape watering.